Old school readers will recognize the name Paul Avgerinos. He is the Grammy winning new age musician who has been kind enough to be interviewed for The Magical Buffet on and off since 2007. When he emailed me about his latest project, I thought it would be of interest. 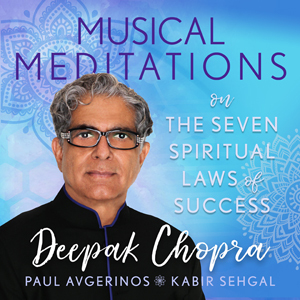 To celebrate the 25th anniversary of Deepak Chopra’s 1994 New Age classic NY Times bestseller, “The Seven Spiritual Laws of Success”, Avgerinos has teamed up with Chopra and Grammy winner Kabir Sehgal to release “Musical Meditations on The Seven Spiritual Laws of Success”. In “Musical Meditations on The Seven Spiritual Laws of Success”, there is a summation of the essential meaning of each law, followed by a meditation on the essence of that law with guidance on integrating this wisdom into your life and being. Newcomers to this material will find an accessible path to understanding and for those familiar with the material, it’s a pleasant refresher course. There is also a bonus Mindfulness meditation included.